If you haven't read it yet, go back to our great deck designs starting page before reading this section. Who says that deck boards all have to go the same direction? How boring. There are some rules of construction, so you can't just put deck boards down in any way, but you do have some leeway. Deck boards have to lay across the joists - they have to be supported. But they can be laid at angles. Note: I recommend spacing the joists at 12" rather than 16" if you are using angled boards. Check your local code office for local regulations. You can stagger the direction of the angles to create interesting patterns. Also consider "picture framing" your deck by turning one board across the ends of the others. If you are using composite decking material, you can use a different color to create even more of a unique look. The different colors can be used at other transition points, not just at the edges. GREAT DECK DESIGN TIPS - #7 Light It Up! One way to really make your deck stand out is the use of low voltage lighting. You can create a warm inviting atmosphere for nighttime use of your outdoor living space. This technique has another advantage - it's not particularly expensive! Low voltage wiring does not require a licensed electrician to install in most jurisdictions. Be sure to check with your local code compliance office to be sure. Even if you don't want to do the work yourself, most deck builders and landscapers are able to do it. You can light up your deck in many ways. Put lights in the step treads, on the post caps, on the posts, under the rails...almost anywhere you want. You'll get the added bonus of increased safety. While you've got the wire out, maybe you'll want to install some wire for a sound system as well. Your choice of deck railing can make a huge difference in the finished look of your deck. 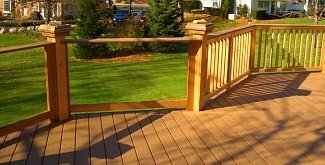 Even a basic, square, treated pine deck can really "pop" with the right deck railing. Round black aluminum balusters look great with treated rails and posts. Mix and match colors and materials for a dramatic appearance. vinyl railing is relatively inexpensive and comes in several colors. The fact that there is no maintenance doesn't hurt either. Don't feel like your railing has to be made of the same material as your decking. If your view just can't be obstructed - maybe glass deck railing is your best choice. Before you pick out that spectacular deck railing system - make sure you actually need railing. Jurisdictions vary, but if your deck is less than 30 inches from the ground, chances are that you don't need railing. If your deck is higher than that, maybe you could step it down to a lower level so that your outer edge will be below the code maximum. If you do step down from an upper level, even if you still need railing you should be able to see over it easily from the upper level. If you have a great view, but you can't get around the need for railing, consider cable railing or even glass railing. You'll pay more, but a great view is well worth the extra expense. Planters, deck boxes, or benches can help to create an edge where there is no railing. 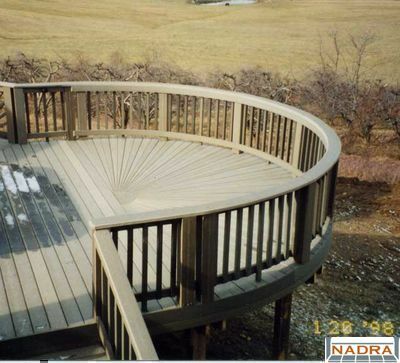 A round or curved deck will make a big dramatic impact every time. Of course, it will cost more. Sometimes a lot more. You will waste more material and your labor charges will be higher. But if you can afford it, this is one of the most elegant touches to any deck design. If you can limit the use of curves to areas without railing, you'll help to keep the cost down. Curved railing is usually custom, and therefore is expensive. So think about using curves when you step down from one level to the next. You'll get the impact of the curves without the expense of the curved railing. Now go back to the beginning and make sure any of these deck design tips you plan to use are still in keeping with your original concept. Does your original size, shape, and materials still work? If not, keep tweaking until it all works together. 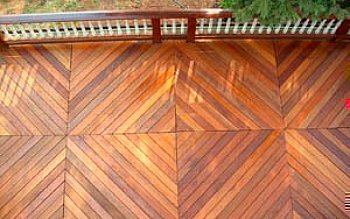 The time and effort spent with these deck design tips will make all the difference later.